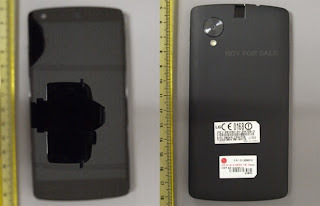 Clear shots of LG device hits FCC - Is this the Nexus 5? Some of the clearest shots yet of the rumored Nexus 5 have been made public by the FCC. In filings for the D820 it's pretty clear that we are dealing with the device that was accidentally shown in the Google video unveiling the Android KitKat statue. Now that we have some of the more important specs such as the 5-inch display, Snapdragon 800 Processor, NFC, 2300mAh and of course Android 4.4 KitKat all that's left is for Google to finally unveil the device.